Our motoring expert, Ted Wilkinson, he of the Guild of Motoring Writers, has been to sea choosing Emirates as his means of transport in order to join Silver Shadow at Singapore via Dubai. “My first experience of flying with Emirates London – Dubai – Singapore indicated that this vibrant and young airline is a premium grade operation in every respect. Sampling the Business Class lounge at Heathrow proved a welcome start to a long haul flight; 5-star comfort, an abundance of well presented and appetising freshly prepared food and a panoramic view of airport life. Even the sun was shining. The imaginative design of the A380 accommodation showed that very high levels of comfort had been achieved – Business Class features a full stretch-out bed facility while Economy Class seating is generously wide with equally generous leg space and the head rests have fold/mould side flaps to reduce neck fatigue. First Class passengers get the luxury of shower rooms in the nose of the plane which have proved more popular than expected. There is also a comfortable bar at the rear on the First/Business Class Upper floor with stand up and couch accommodation. The interior decor carries on the 5-star standard of the lounges with burr walnut trim in abundance, even in the toilets! Cream effect colour scheme with a touch of gold relief here and there is classy without being pretentious. Communication facilities are well provided for, including air-phone availability and charging facilities for mobile equipment. An in-house video presentation on the excellent entertainment system by Emirates’ President Tim Clark was certainly zestful, telling of the new Concourse, shortly to be opened at Dubai, that will provide First and Business Class lounge accommodation for around 3,000 passengers and with docking facilities for 28 A380s at one time”. SILVERSEA: Cruising with the small though generously appointed ‘6-star’ Silversea fleet has become a habit for many of its clientele. Having tried my first cruise two years ago on Silver Cloud from Rio de Janeiro and northwards up the Brazilian coast and into the Caribbean and culminating in Miami, we have been back again, this time out of Singapore on the larger 28,000 ton Silver Shadow and along the Vietnamese coast to Hong Kong. 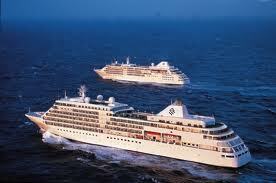 Silver Spirit is larger still with accommodation for 540. 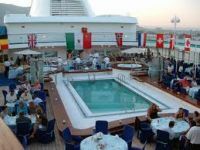 For me the attraction is the all-in package (including staff gratuities), though not cheap but very good value, though I would rather do without the US$1,000 on board spend a sort of back-handed discount you have to use up. Apart from the shop, the spa treatments and hairdresser or some of the very well organised shore trips, about the only place to spend money is in the exclusive Relais Chateau-Le Relais restaurant that offers gourmet themed menus and even finer wines. Whilst we were on board there were lobster, asparagus and Spanish evenings. The standard of accommodation and cuisine is very high and with a more than competent choice of complimentary drink. With just over 300 passengers and about the same number of crew it is almost like a small village community of generally like-minded people – I actually had the same butler from the previous cruise – Andrew – who meticulously looked after our needs, keeping the en-suite fridge topped up with the right liquid refreshment, fresh fruit on the table and a shine on my shoes. 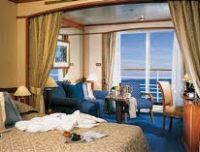 The all-suite ships offer large cabins, mostly with balconies, with curtain separating a lounge area from the bedroom, walk-in wardrobe and a bathroom with separate shower. There is a choice of up-market toiletries too. On boarding in Singapore we were greeted by the friendly staff and offered lunch in the attractive main restaurant, after which we went to our suites where our butler unpacked our luggage. 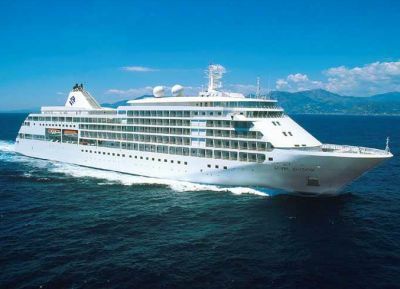 Speaking at dinner with the ship’s Hotel Director, Flavio Giola, I learnt that repeat customers were 70% and membership of Silversea’s Venetian Society (membership acquired after your first cruise) included season cruisers, some having notched up over 1,000 days with Silversea. Giola’s comment that ships are refurbished every two years was evident in the provision of probably the best sun-loungers I have ever crashed out on. These basket-work loungers also included some roofed versions rather like a giant cat basket which proved ideal for nodding off with a touch of shade. There are sufficient dining options with few needs to book but if the weather is right try the on-deck dining which now features an on the rock experience. Yes, the rock is a pre-heated slab of stone on which to cook either an excellent steak, a lobster or two or a fresh fish. Speaking to some regular cruisers on board, I got the general impression that they considered entertainment a bit limited compared with larger ships and when comparing with my initial and longer Silversea cruise I must concur but given the effort and quality of the six-person entertainment team, I relaxing after a excellent and leisurely dinner in the cosy theatre. We found it a pleasure to experience the professional yet very friendly attitude of the staff and their expertise at multi-tasking. On the safety aspect, it was noticeable (and previously too) that well before the ship sailed a full Muster Station drill was carried out, including a roll call.